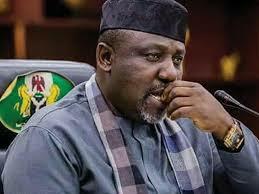 Governor Rochas Okorocha has prayed that God should help the State get a worthy successor to continue the good works already done or started by his administration, stating that he should be concerned about who succeeds him so that the State won’t be taken backward after his exit. The governor spoke weekend at the Commissioning and handing over to the State branch of the Christian Association of Nigeria (CAN) an Ultra-modern Office Complex built by his administration, adding that he has gone through the length and breath of the State and he knows what can be the best for the State and her people. The governor said, by building and handing over such magnificent edifice to CAN, he has fulfilled one of the promises he made to God when he was seeking for power in 2011, adding that the edifice would continue to be a symbol of peace and unity in the Christendom. His words “Most Imo people never believed that I was a Christian. Some of them had doubts over which denomination I had belonged when I came as governor. I was therefore baptized with so many names, but I never allowed such developments to stop my vision to work for God and also win souls”. The governor had earlier handed over similar office Complexes also built by his administration to the Nigeria Union of Journalists, NUJ, and the Nigeria Labour Congress, NLC, Stating that he has built these office Complexes to encourage institutions to strive in the State. He continued “I am delighted that I have fulfilled one of the promises I made to God when I was seeking for power in 2011. I am particularly happy that the vow I made to God has been fulfilled today in many ramifications. This came with a lot of difficulties as most people never understood me and some never even believed I was a Christian”. He explained “One of my very first projects was the construction of a modern Chapel in front of the Government House. Today, we have Chapels in all the Twenty-Seven Local Governments in the State and currently been manned by Pastors and Reverends. And the Chapels also serve as branches of CAN in the 27 Local Governments”. The governor stated, “As I hand over this edifice to CAN, I pray and hope that this edifice will continue to be a symbol of peace and unity in the Christendom. In few months to come, I will be exiting as your governor, I have been praying to God Almighty to help Imo State get a good successor to continue with the good works already started. And I am giving Imo people Uche Nwosu because he will serve them with the fear of God”. In his speech, the CAN National President, Rev. Samson Ayokunle commended the governor for building the complex, describing him as a man of goodwill, noting, “It is a sacrifice and an offering to the Lord. God will continue to reward the governor and his generations as he has deemed it fit to build a house for God so shall God build a house for him in his kingdom”.